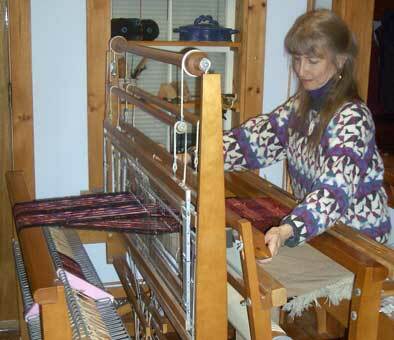 Christine weaves each scarf on her “counter balanced” loom. The length wise threads, known as the “warp”, which have been threaded through metal “heddles” mounted on wooden “shafts” are lifted by pressing on “treadles” that enable her to run a “shuttle” holding a spool of yarn, known as the “weft” through the space. 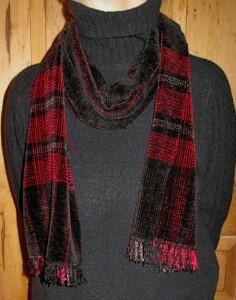 Every scarf illustrates her concern for the unique combination of colors used in both the “warp” and “weft” of each piece. The “warp” is clearly visible in the fringe, while the “weft” is more clearly shown in the dominant colors of the body of the scarf and in the accent stripes. Great care has been made to make each photograph show the actual color. While every computer monitor shows color differently, verbal descriptions accompany the photos, to help describe the actual colors. Christine touches a spinning wheel for the first time. 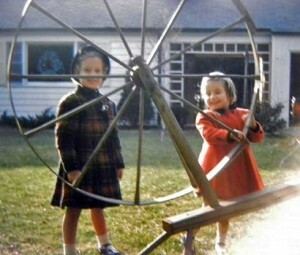 Christine’s love of textiles started at a young age, her first encounter with an historic “Walking Wheel” (see her at left in the red coat) was as a youngster in the early 1950’s. 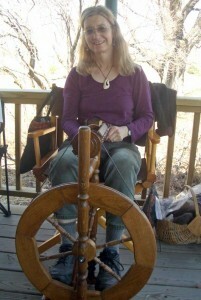 Many years later and after spinning thousands of feet of wool, silk and flax, have not dampened her enthusiasm for spinning. 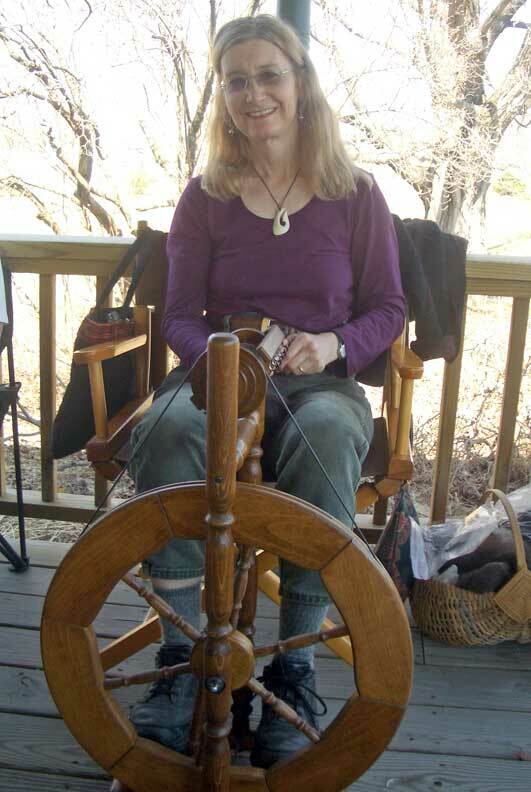 While Christine weaves for a living and certainly enjoys the process of weaving, spinning is her recreation which she does on one of the three spinning wheels in the studio. Spinning on her Louet wheel. After graduating from Philadelphia College of Art in 1973, Christine embarked upon a period of self-discovery. Earning a Master’s Degree in Education at Columbia Teachers College, she put her skills to work as site manager of Philipsburg Manor Living History Museum in Tarrytown, New York. For five years she was responsible for the operation of this wonderful 18th century attraction. 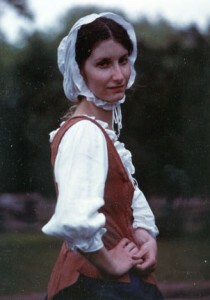 Using her interest in history and education, she milked cows, cooked on the open hearth, ran a water powered grist mill, demonstrated and taught spinning and weaving. Since 1984 she has been a self-employed weaver, producing her own line of scarves and shawls. Her strong sense of design stands out in her creative application of colors used in the warp and weft of each piece. Her early work was woven in wool, cotton & silk and she often used her handspun yarns. As the years passed she slowly transitioned to using mostly rayon chenille in her scarves & shawls. In addition to her own work, she manages the showroom at the pottery, is web master for this site and does the graphic design work for all of Robert & Christine’s art & business literature. During the summer months she greets visitors to the showroom and cares for the extensive gardens. 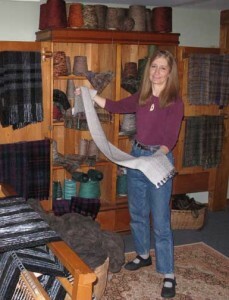 In her studio holding an Alpaca scarf.